Q & A with Incyte Pathologist, Felix Martinez, Jr., M.D. What are the goals of cervical cancer screening? Identify women with CIN 2,3. Establish the interval for the next screening tests. What role does the HPV test serve in cervical cancer screening? The HPV test is a risk stratification test. Appropriately ordered positive results identify women who have higher risk and, therefore, need further testing or colposcopy. Do all women with HPV infection develop cervical cancer? No. In fact, the immune systems of a great majority of infected women clear the virus and thereafter confer immunity to that strain of virus. How long does it take to develop cervical cancer? Roughly ten years from the time of infection to invasive disease. Routine interval Pap testing has been very successful in identifying cervical cancer and its precursors, in part, because there are usually several chances to identify the disease in a ten-year period. Why is age an important factor in current screening algorithms? Young women have very robust immune systems which halt and clear viral infections in almost all instances, including those of high risk HPV subtypes. Unfortunately, immune response diminishes with age. Currently, for women 21 years and younger, HPV testing is not recommended because their immune responses are so effective in clearing viral infection. Also, because of high HPV prevalence, the results of HPV testing are not useful in risk stratification for women under 21. 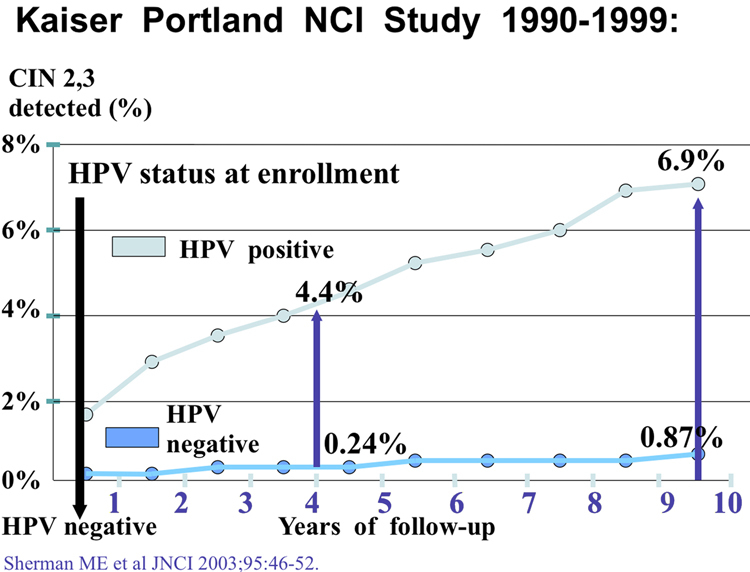 How does the epidemiology of HPV infection play a role in cervical cancer screening? What is the rationale for using a combination of the Pap test and the HPV test to screen for cervical cancer in women 30 and over? The HPV test is more sensitive than the Pap test in finding women at risk for having cervical cancer and its precursors (i.e., CIN 2,3+). Women over 30 are those most likely to have persistent disease. HPV is the causative agent in virtually all cases of cervical cancer. Persistent infection with high-risk HPV, therefore, is necessary for the development of cervical cancer. Why not just use the HPV test alone and do away with Pap testing? Most women infected with HPV will not develop cervical cancer. Although the HPV test identifies women infected with high-risk HPV subtypes, it lacks specificity to further identify women with CIN 2,3+. The Pap test, despite its shortcomings in sensitivity, can very specifically identify CIN 2,3 and invasive squamous cervical cancer. The use of both tests together provides the best currently available technology to screen for cervical cancer. Why is it recommended that co-testing begin at age 30? 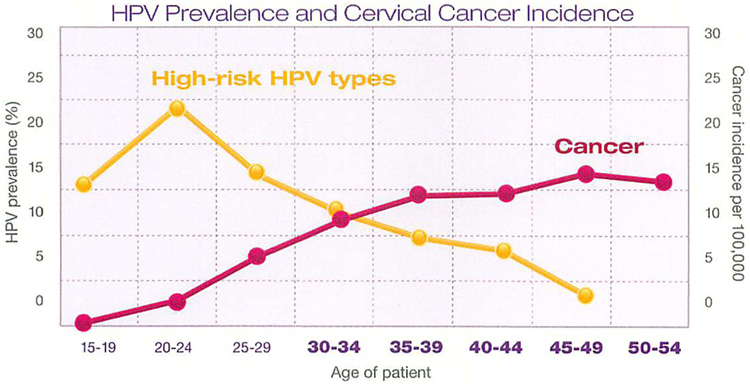 Age 30 represents the intersection of diminishing HPV prevalence and rising risk of having cervical cancer. (see Fig. 1) Risk of having cervical cancer incorporates the combined effects of diminished immune response, persistent infection, duration of risk factors (e.g., cigarette smoking), and risk of exposure to high-risk viratypes. Doesn’t combined testing cost more? Yes, initially. In addition to a routine monolayer Pap test in co-testing, an HPV test is also routinely performed. Co-testing was developed in part to reduce costs by lengthening screening intervals to every three years for women who are Pap negative and HPV test negative. Combined testing does detect more CIN2 and CIN3 lesions during exam than routine cytology. Screening using both tests, therefore, is more efficacious. What is the risk for cervical cancer in women who are Pap negative and HPV negative? Less than 1 in 1000 (< 0.1%). The American College of Obstetrics and Gynecology states: “The natural history of the the disease and several large longitudinal studies show that women with negative Pap and negative HPV test results can avoid re-screening for 3 years, even if they have new sexual partners”. ACOG Practice Bulletin. 2005;61:3. How many women will “lose” an HPV infection (i.e., become HPV negative after a positive HPV result)? Eighty per cent (80%) of women resolve their infection in 12-18 months. The remaining 20% are at high risk for developing CIN 2,3+. Ho GYF et al. NEJM. 328:423-428. What is the 10-year risk of developing CIN 2,3+ in a woman 30 or older with Pap negative, HPV positive results? What is meant by “chronic carrier” and what are the implications of this designation? Chronic carriers are women in whom HPV persists even after initial clearance of the virus. Thus, a woman who was infected with HPV could have had an immune response sufficient to clear the virus in her youth and become HPV negative, only to have HPV reactivation (and correspondent HPV test positivity) later in life. Such women are at high risk for CIN2,3+ and are the primary target for long-term population screening for cervical cancer. What women are most likely to be chronic carriers? Women who are 30 years of age and older. What is the cellular mechanism for chronic HPV carriage? The HPV virus occasionally can persist for years within cervical cell nuclei in very low copy numbers and at levels undetectable by any testing method. The reason for this is not fully understood, but episomal HPV and integrated HPV DNA play key roles. Reactivation of “hidden” HPV virions is analogous to a different but common viral infection: shingles. Here, childhood chicken pox herpesvirus, after clearance, lies dormant in paravertebral ganglia until, unpredictably but during periods of cellular stress, it reactivates painfully along dermatomal distributions later in life. Have there been any obstacles in the universal acceptance of co-testing? Time required for patient questions and education. Complicated messages to convey to the patient. Extended screening intervals (i.e., every 3 years for Pap negative and HPV negative results). Felix Martinez, Jr., M.D. is a general surgical pathologist for Incyte Diagnostics. 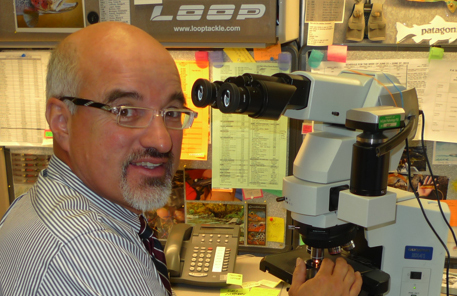 Dr. Martinez is a fellowship-trained, Board Certified Cytopathologist. He also likes fly fishing.